Alan Parks helped craft the Homer Climate Action Plan in 2007. Homer needs to do more to adapt to a changing climate. That’s according to a study released earlier this year. Researchers say Homer is on track when it comes to mitigating climate change, but needs to be more prepared to deal with its effects. The city is thinking about updating its response to the issue. Homer resident Alan Parks is standing on a vacant lot near downtown where the city is set to build its new police station. While the ground has yet to be broken, Parks notes that this location is right above the tsunami zone. But making sure the police station is farther above the maximum tsunami inundation zone is just one of a very long list of concerns Parks has. He helped craft the city’s climate action plan back in 2007. He said the city has followed the plan by bringing natural gas to the area, transitioning nearly all of its buildings to LED lighting and other initiatives. The city said those moves have reduced its carbon footprint, and while Parks applauds those efforts, he said the city has focused too little on adapting to climate change. That focus doesn’t surprise Jeff Birchall, an assistant professor at the University of Alberta in Canada. Birchall and his colleague studied Homer’s response to climate change in 2016, and published a study on that work earlier this year in which he said the city could do more. Birchall said larger storm surges and increased erosion due to climate change is already impacting Homer. He said the city needs to implement policies that will prevent development in areas, such as the Homer Spit, that are prone to the effects of climate change, especially during natural disasters. But he knows that crafting those policies is easier said than done. 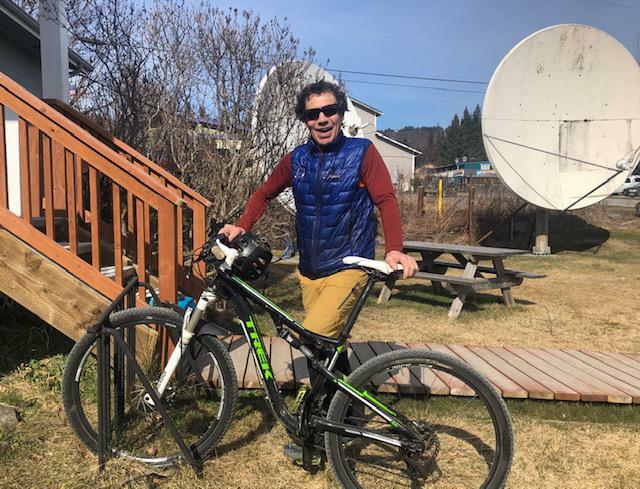 He said funding projects is also an issue for small communities like Homer, but he said local governments often have the ability to be the first line of defense against climate change. In Homer’s case, he said the issue has been a low priority for the Homer City Council in recent years. Council member Donna Aderhold agrees. She said it’s been hard for the council to step back from more immediate issues and revisit the plan. But this past October, Aderhold decided to do just that. She’s excited to potentially update the city’s climate action plan on paper, but acknowledges it will be an uphill battle when it comes to funding the adaption projects it may call for. And figuring out how to protect private infrastructure along bluffs and other problem areas in the city will also be an issue. But as the city decides whether to modify its plan, those like Parks are worried the city and the council lack the political will to fully address climate change. “It’s kind of like we’re starting over but we're not completely starting over but there's just a lack of real leadership going on with the city right now in terms of climate change,” he said. The Homer City Council will officially decide whether it wants the city to revisit the climate action plan in the near future. It remains unclear, what, if any, changes could be made.